With that overall objective – intentionally a rather elastic phrase – in mind, I’ll do keywording in 3 passes. Firstly I pretend I’m describing the picture to a blind man or stranger who knows nothing about anything. So for an image like this from Arches, I don’t start off by adding keywords like “Landscape Arch” which mean nothing to my hypothetical stranger. I’ll add words like “arch”, “desert”, “sand”, “red rock”. 2. What does the picture mean? Second, I try to add abstract or adjectival terms – eg isolation, remoteness, geology, erosion, sculptural, solidity, resistance. 3. What do I know about the picture? 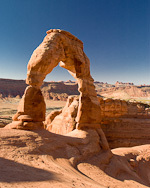 Only then will I add the easy words, information that I actually know about the image’s contents – Delicate Arch, Utah etc. In some ways, this 3 phase approach is back to front. That’s deliberate because it forces me to describe the picture’s actual contents, add as many relevant keywords as I can, and not be lazy and just add the obvious words. For example, if I started keywording this image with Swaledale, Yorkshire, England, some of my keywording time and enthusiasm is already expended by these easy terms. So will I have enough time and keep going long enough to add purely descriptive words like walls, barns, grass? And will I really get round to adding lateral or abstract words like “green” or “patterns”, which are also what the image in this post is “about” and which I or someone else may subsequently use as a criterion for choosing pictures? Adding the easy, “known information” keywords last is my way to make sure I reach my goal of the “maximum number of relevant keywords in the time”. I tend to have 6-15 keywords per image, make a lot of use of metadata presets (so I can update location and other fields in one go), and use keyword sets for images where there might be a bit of variation from picture to picture – eg a set might include one item per major arch. My keyword list is completely flat – no hierarchies – and I think not worrying about hierarchical structures and organisation also saves me a bit of time. While I see keywording as something you do while images are still new, I will often add more keywords later. As for real names, I include them as keywords only if they are well known people, but not for members of the family or people who aren’t known outside one’s circle. Place names get added as keywords if the image is typically “Utah” or “Swaledale”. There are other ways to keyword, but that’s how I actually do it. For what it’s (beards)worth. See these posts on keywording. Hello, Very nice and profitable post. you have shared some good points about keywords that i never thought about. Authentic submit today! I genuinely like this excellent resource with a pile up details regarding the subject. Thumbs up for you! It sounds great! I missed the festival this year, gonna attend the festival next year. Thank you for the information. Just saying hello and continued thanks for your website. If I’m away from Lightroom for a time (like last several months), when I come back, I inevitably wind up back on your site, re-reading your articles on organizing. They have always been one of the best ways for me to “oil the gears” of my Lightroom skills and reminding me of your philosophy of photo organizing/developing, which I try to mirror. Oiling the gears is a nice way to put it, Dawn, though it does now worry me that I always think I’m trying to “provoke” people to think through what they’re doing! Like some of the others above, I have only just stumbled across your site. I am new to lightroom and moved fromPhotoshop Elements 9. I like this article on keywording and have spent all morning do it! Keep up the good work – just off to explore the rest of your site. Thanks, Mike – I try my best to use plain English! Hi John. Just stumbled upon your site because of your List View plugin. I found keywording a really painful task so I ended up building http://www.mykeyworder.com. I thought if your readers ended up on this page, they might find my free tool useful. All the best. Thank you for sharing your approach. 1) public photo, I NEVER include a name keyword if it’s related to family/freinds. Only public figures, i.e Obama. 2) private photos that will remain private, I always include name keywords because in the long run it helps (me). In a small party, 10 years after of graduating, i fired up LR, connected to the storage and started filtering images based on individual names, for a quick remembering of those times. BTW, I just discovered your blog, so I’ll keep reading it. Good work ! Some really good ideas here and a great way to get your brain set to “Keyword Mode”! LOts of good stuff here. Glad I found you!